This news is those who fall just like a bomb, spoil all the programming and plans drawn up, but that fill us with joy and make us tremendously happy. Seigokan Europe has a new member, no less than in England. 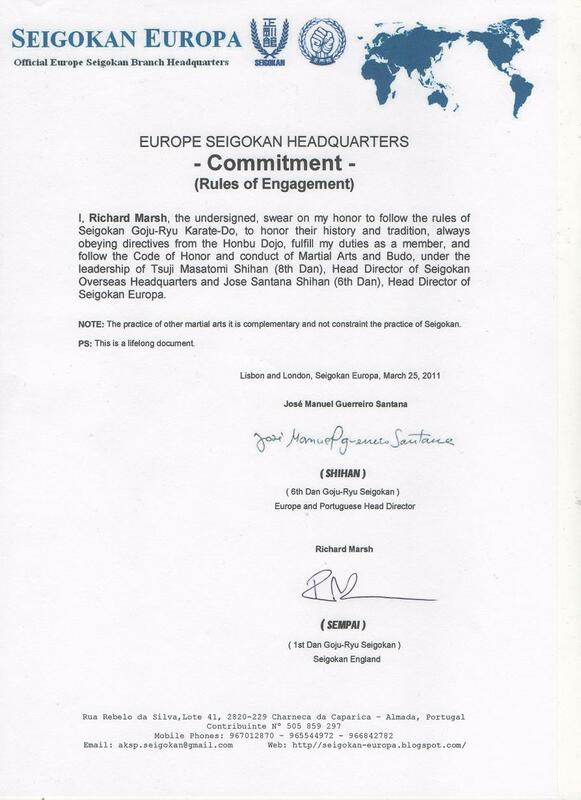 Richard Marsh Sempai (1st Dan), a promising young man with a past history with origins in Seigokan, requested recently, in March 23, 2011, his formal membership to Seigokan Europe, having signed his Seigokan Commitment, jointly with the European Technical Director Jose Santana Shihan (6th Dan), pledging to comply with, enforce and follow the rules issued by Seigokan Honbu Dojo in Japan, through the Head Director of Seigokan Overseas Headquarters, Tsuji Masatomi Shihan (8th Dan). Step by step, but with feet firmly on the ground, Seigokan Europe grows. Long life to Seigokan Europe! Thank you for the email from many overseas Seigokan members. We are safe now, most Seigokan Dojo are in west and south Japan. Hyogo,Shiga,Fukuoka,Kyoto,Gifu prefecture do not have damage. I do not get bad news from Seigokan members in Japan. The earthquake occurred about 26 hours ago. I worry about aftershock and tsunami. When I get another Seigokan news,I will let you know.